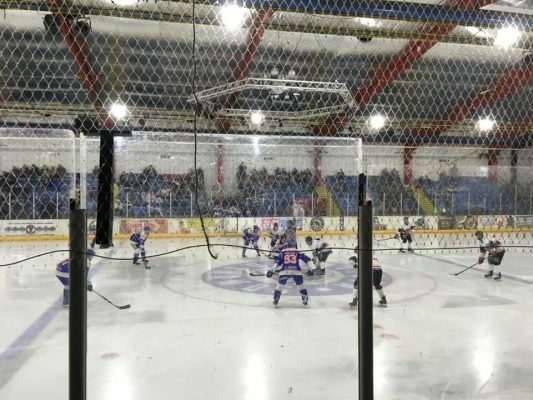 Invicta Dynamos suffered a 9-2 defeat to the Peterborough Phantoms at Planet Ice Gillingham on Sunday night. Both teams showed dominance, Phantoms with skill and Dynamos with physicality. Joe Allen fired a slapshot on Jordan Marr, but it flew over the top of the net. Owen Dell had a try at the Phantoms netminder with a wrist shot but could not get it past Marr. Phantoms took shots on Conor Morris, and it was Ales Padelek who opened the scoring with a shot past the netminder. Dynamos pinned the Phantoms in their end as they took several shots on Marr who saved them all. Peterborough took control and Petr Stepanek cannoned a slapshot towards the Invicta net but missed. End of a scrappy first period saw the Phantoms leading 1-0. The second period saw Peterborough Phantoms dominate and increase their lead to 2-0 as Robert Ferrara scored past Morris. Another quick goal from Corey McEwan which saw retaliation from the Dynamos as they fight for the goal to be disallowed but the referee denies them. A minute later Bradley Bowering increases the lead once more to 4-0. Dynamos battled for their first goal but ended up back in their own end. Phantoms player William Weldon lifted the puck over Morris’s shoulder and into the net. 5-0 to the Phantoms. Morris tried to switch with Long in net but was not given permission. Phantoms thought they had scored again but the referee wiped the goal as the Phantoms player kicked the puck. Morris and Stepanek exchanged shoves after the whistle and thinking there may be a fight to come the refs intervene. Morris threw the puck onto the ice and received a two minute penalty for unsportsmanlike conduct. Scrappy last few minutes of the period which saw Harrison Lillis and Stepanek exchange rough shoves and almost fight after Stepanek charged at Lillis. Referees once again intervene. End of the second period with Peterborough leading 5-0. The start of the third period saw Marr switch with Ryan Bainborough. A sixth goal from the Phantoms scored by Stepanek. Quickly followed by a seventh power play goal from Glenn Billing from close right. An irritated Morris left the ice after the goal and Adam Long took his place. However a change in netminder did not stop the Phantoms as Pollard shot the puck past Long moments later to make the score 8-0. Disheartened Dynamos fought back and carried the puck down to the Phantoms zone. Callum Best skated down the right wing and makes a shot on net which Bainborough saves with his pads but Piacka went in for the rebound and found the back of the net. Finally putting the Dynamos on the score with less than 10 minutes left to play. The small victory was taken away as Bowering wrists the puck into the Invicta net. Stepanek skated past the defence and was left with Long but was denied as the netminder holds the puck. With two minutes left of the period, captain Anthony Leone found the puck at the edge of the crease and lifted it over Bainborough. The score increases to 9-2. A scrappy game saw the Peterborough Phantoms take home the 9-2 win. Dynamos fought hard but it was not enough to chase the Phantoms. This entry was posted	on Sunday, October 28th, 2018 at 8:00 pm	and is filed under Featured, Ice Hockey, Other Sports. You can follow any responses to this entry through the RSS 2.0 feed. Both comments and pings are currently closed.